The Black Turtle bean is a full flavoured and nicely textured ‘dry’ bean that is perfect for the Mexican and South American food experience. When you cook them the water stains with the black colour of the beans and you can use that in another dish as a basic tasty stock. When cooked the beans stay black and pump up into a really nice soft texture that allows them to stay whole but also crush easily into a soft dark paste that can be enhanced with chili – typically dried Chipotle to really build the smoky back flavour – and with cilantro etc. It is also a tradition to use a sprig of epizote leaves when cooking to add that interesting back flavour. The epizote – aside from the added back flavour – also has the supposed effect of reducing or counteracting the intestinal gaseous nature of the dried beans – although if beans are properly cooked they should not have that effect. Epizote also was traditionally used for its deworming side effects. Make sure you take the epizote out when the cooking is finished. The Black Turtle bean is apparently just another variation of the usual Phaseolus vulgarise string beans species group. They are usually a fairly small bush but they produce well and are very hardy. The beans flower in pairs and there are usually quite a few of them on each bush. 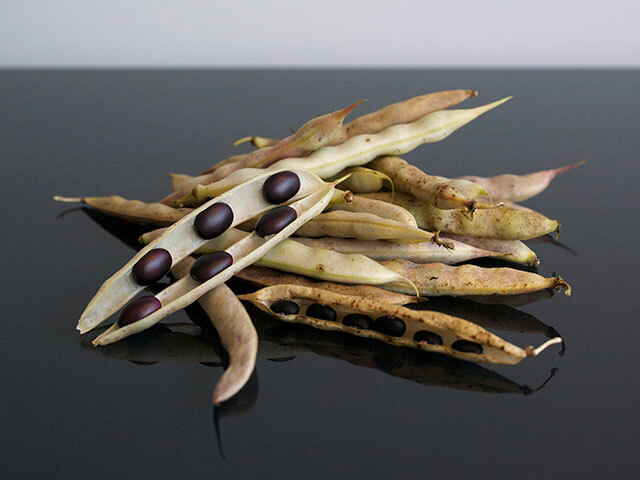 It is a very easy bean to grow and basically you just wait for them to dry off on the plant and then harvest – usually about up to 6 months to get a fully developed plant and beans to the ‘dried on the plant’ stage. When the beans are dry enough you just pull the whole plant and strip the bean pods off. This creates a giant pile of excellent legume compost material that breaks down quite fast. I have no idea why it’s called a Turtle bean but possibly turtles eat it in it’s natural environment or it grows near water ways etc.